Western International University is also featured in our ranking Top 25 Most Affordable Online Bachelor’s in Accounting. The accounting program at Western International University is designed to accommodate the ever-changing world of accounting, business, and globalization. At the university, there are three degrees available in accounting including a Bachelor of Science in Accounting, Master of Business Administration (MBA) in Accounting, and a Master of Science (MS) in Accounting. For students who enroll in the bachelor’s degree program at the university, they can expect to spend approximately 3.6 years in the program or 189 weeks if they come to the program without transfer credits. The total credits required in the program is 120, and books and supplies are included in the tuition. Learning outcomes of the BS in Accounting program include the ability to apply accounting concepts and principles in order to analyze business transactions and the knowledge to create solutions to today’s business issues using modern technology and practices. Students will also learn to interpret information in the financial world employing qualitative and quantitative methodologies, as well as use modern technology to meet the demands of the modern business environment. The program is also designed to help students understand how to communicate well in business environments so as to enhance problem-solving capability, as well as understand how ethical decision-making can impact the workplace and the future of business. Students will take credits that cover general education, elective courses, and classes in accounting. Students will also take a capstone course worth three credits. Classes within the major requirement include Foundations of Accounting II, Intermediate Accounting I, Managerial Accounting & Decision Making, Individual Taxation, Government & Non-Profit Accounting, and Business Taxation. Students will also take Marketing Management, Operations Management, Political, Legal, & Ethical Issues in Business, and Financial Management. These and other classes will help prepare students for work in a variety of professional settings in public, non-profit, and private accounting. Not only may students find work in the accounting profession, but they may also enter a graduate program at Western International University or another institution of higher learning. Since students may enter the program from virtually any state in the country, it’s important for students to examine the requirements for working as an accountant in their chosen state. Taking the CPA exam and gaining licensure is a similar process across different states, but the program at the university has been designed to meet the standards published by the National Association of State Boards of Accounting (NASBA). Programs are also designed with input from the American Institute of Certified Public Accountants (AICPA), which means that students will enjoy a curriculum that should help them become licensed anywhere they want to work. 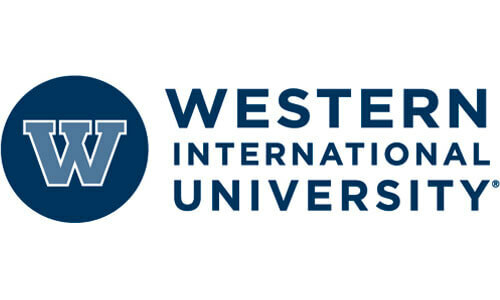 Western International University is meant to offer online programs to adult learners. The school was founded in 1978 and offers degrees at the associates, bachelors, and masters degree levels. Around 1,300 students are attending the school, which focuses on business and technology for the degrees it offers. The school’s headquarters is located in Tempe, Arizona, but the school’s virtual classroom is available online from anywhere. The university is part of the Apollo Education Group, which is a corporation based in Arizona. Western International University is just one of several subsidiaries operating under the Apollo umbrella. The education group was turned into a private entity when it was sold to investors in 2016. Overall, the school system makes more than 3.5 billion dollars a year and operates more than a dozen schools across the country. Western International University has received regional accreditation from the Higher Learning Commission. The school has maintained its regional accreditation status since 1984. The reaffirmation for the school occurred in 2013, and the next reaffirmation is scheduled to begin in 2022. The university is also accredited to offer degrees to students in most states around the country. One of the only places the school can’t enroll students is Massachusetts. In Arizona, the school is state approved by the Arizona State Board for Private Postsecondary Education. As a business operating as a for-profit university, the school has also gained accreditation from the Better Business Bureau and has maintained that accreditation since 1995. The admissions process begins when students try one course to see if the university is a “good fit” for the student. Undergraduate students will take Culture & Globalization, and graduate students will take Global Communication for Professionals. At the conclusion of the course, students who decide to attend the university can begin taking their monthly courses immediately. Students will pay for their degree only if they decide to continue with the program after the first introductory class. Enrollment requirements include a GPA of at least 1.67 in the introductory course for undergraduate enrollment or an average GPA of 2.67 in the graduate degree level. Tuition at Western International University is $250 per credit for undergraduate students and $350 for graduate students. The total cost for an undergraduate degree is $30,000 and requires 120 credits. The total cost for a graduate degree is $13,650 and requires 39 credits. There are no additional fees associated with attending the university. Students may reduce the amount of money required to pay for their education by submitting evidence of past college classes taken that may be used for transfer credits. The school also offers a variety of tuition reduction options for veterans through its “Principles of Excellence for Educational Institutions Serving Service Members, Veterans/Spouses, and Other Family Members” program. Students who attend the university are eligible for financial aid through the federal government and should submit their FAFSA form on time to ensure eligibility for loans, grants, and other aid. The number of students receiving some type of grant or scholarship aid at the university is seventy percent, and about thirty percent of students receive federal grants. Sixty percent of students receive federal student loans, and about the same percentage of students also receive alternative loans in the form of options like private student loans from banks. Not only can students apply for scholarships and aid through the university, but they may also find financial aid options from private entities and organizations that offer scholarships to students in various circumstances. For example, students who have been in the military may qualify for military-themed scholarships at Western International University.